Friday night, Las Vegas, Nevada, that sir, is a dangerous combination. But before the late night festivities, dinner was the focus, and after scouring chowhound, I was dying to try Mon Ami Gabi in the Paris casino. Now, I as a foodie, have great reverence for Chowhound. 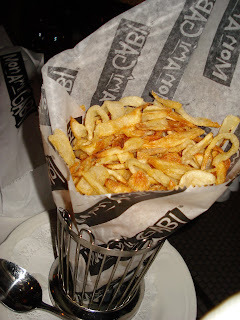 It’s a great place for food minded folk to share ideas and suggestions, and Mon Ami Gabi kept getting recommended. I have to ask, what they hell is everyone talking about? It’s not bad food, but this not a restaurant you should go out of your way for. I had the escargot, again not bad, just not worth getting excited about. 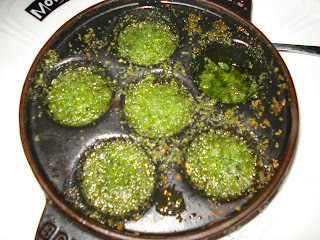 The escargot had potential, but it just lacked that perfect amount of garlic. Maybe I made a mistake by not ordering a steak frites, I had the notion that this “bistro” would be like my favorite DuPont haunt, Bistro Du Coin, and specialize in escargot and moules frites. 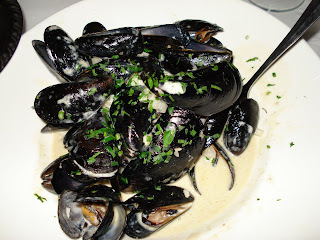 These mussels came in a cognac cream sauce, and they were actually a bit insipid. After a disappoint with the escargot and mussels, I thought the fries would be the saving grace, maybe even twice fried for that perfect crunch and texture. At first glance, I thought to myself, these have potential. They look like they were done with an apple peeler. The first fry delivered! It was crisp, well salted, and delicious, but it was all very much downhill from there. The fries had turned into a mushy cold lump. So, in the hopes that a fellow patron of chowhound reads this, please avoid everyone’s recommendations and steer clear of Mon Ami Gabi.